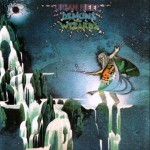 The forth Uriah Heep’s album, “Demons and Wizards”, brought fame, money and fortune to the band. The album charted for 11 weeks in the UK (peaking at No. 20) and for 38 weeks in the USA (peaking at No. 23)*.